James Bond fans know that there is no place better to recapture the spirit and lifestyle of the Bond adventures than Nassau, the setting for three classic movies: "Thunderball," "Never Say Never Again," and "Casino Royale." Now, you can relive these adventures for yourself as a part of Operation Nassau Reloaded 2012, sponsored by Orlandobond and Mrs. Orlandobond, whose prior tours of Europe and the Caribbean enjoyed remarkable success. Next year's tour spans the last weekend in May (May 24-27; the Memorial Day Weekend for us Yanks). We'll stay at the luxurious British Colonial Hilton in downtown Nassau, Bond's base of operations in NSNA and enjoy its five-star amenities, including the only private beach in Nassau. We'll visit film locations from Bond's adventures, with access to such otherwise private locales as Palmyra (Largo's villa) and the Ocean Club (where Daniel Craig seduced Solange). There'll be a chartered boat trip to the underwater locations of the sunken Vulcan bomber from "Thunderball" and the Tears of Allah from NSNA. Certified divers can dive the wrecks, and snorkelers can observe them from the surface. Weather permitting, we'll drive to Coral Harbor to see the site of CR's parkour chase and visit the Coral Harbor hotel, where Bond and Domino tried out their conch chowder. With a Bond costume party and other surprises, plus unparalleled opportunities to meet and mingle with a great group of Bond fans, it's going to be one of the most remarkable James Bond events of the year. Hope to see you in Nassau next May! One month to go! The trailer's due for release while we're in Nassau, and we're counting on some ingenuity worthy of Q Branch so that we'll be able to see it before heading off to dinner at Cafe Martinique. Q is ready, of course. The Disco Volante is fueled and the British Hilton took receipt of several crates of cargo- including Kina Lillet. Several new mission assignments have been added not found on the itinerary. I do hope you don't muck this up James. "The islands are beautiful" (Thunderball, chapter 19), and the CBn contingent is counting the days. Can't wait to see everyone again. The easiest literary location of the trip is the Nassau Airport (Windsor Field). It’s been a while since I’ve flown into Nassau, and I don’t know how much of the airport has changed. When Bond met Felix Leiter there, there was a long, low entrance hall, with a souvenir shop inside (Fleming, Thunderball, chapter 12). As for other literary locations, our hotel is a rare double location that featured both in a film and a novel. The British Colonial Hotel was Bond's base of operations in "Never Say Never Again" and was the hotel where Bond was staying at the time he was treated to the governor's story in "Quantum of Solace" (Fleming, QOS). Speaking of QOS literary locations, Government House is within reasonable walking distance of the hotel, and it was here that the Governor of the Bahamas related the story of the "Quantum of Solace." After telling Bond the story, the Governor bade him good night at the gate (Fleming, QOS). In addition, it's the location from Thunderball where Bond briefed the Governor on Largo's activities (Fleming, TB, chapter 12). The cruise ships should be visible downtown, and Prince George Wharf, where they dock, was the place where Bond boarded the USS Manta (Fleming, TB, chapter 19). Other Fleming locations include the Nassau Police headquarers (Fleming, TB, chapter 14) and the "Domino trail" (my title for this little trek) (Fleming, TB, chapter 11). Domino encountered Bond when she drove down Parliament Steet onto Bay Street, met Bond at the Pipe of Peace tobacconist (now sadly gone), drove him up Frederick Street to Shirley Street, and headed out past Fort Montagu onto the Eastern Road, where she related the story of the Hero on the Player's cigarette packet. Alas, I can find no indication of the spot at Gunpowder Wharf where they talked. There's also a Benson location in Nassau. The Governor of the Bahamas had retired and had a home out beyond the College of the Bahamas, on Thompson Boulevard. He was assassinated, and Bond chased the killer (riding a Vespa) down Thompson, across Meadows Street, around St. Joseph's Catholic Church (Benson inadvertently called it a Baptist church), into St. Bernard's Park. The killer escaped the park across a residential street and shot himself when Bond cornered him (Benson, High Time To Kill, chapter 1). All of the foregoing locations, except Fort Montagu, are in reasonable walking distance of our hotel. When we take the boat out to the wrecks, there are also Fleming sites en route. The literary Palmyra was located in a different spot from the movie version that we’ll visit. It was on the northwest coast of New Providence, on Old Fort Bay. Largo kept the Disco Volante moored in the bay, and his home, Palmyra, was on the shore nearby (Fleming, TB, chapter 13). The police kept watch on the yacht from an old garage on a deserted villa at Old Fort Point (Fleming, TB, chapter 19). Bond and Domino had their tryst a mile further along the beach from Palmyra (Fleming, TB, chapter 18). And of course, there'll be a great selection of Bond movie locations for us to visit. I'm looking forward to joining the group in Nassau! 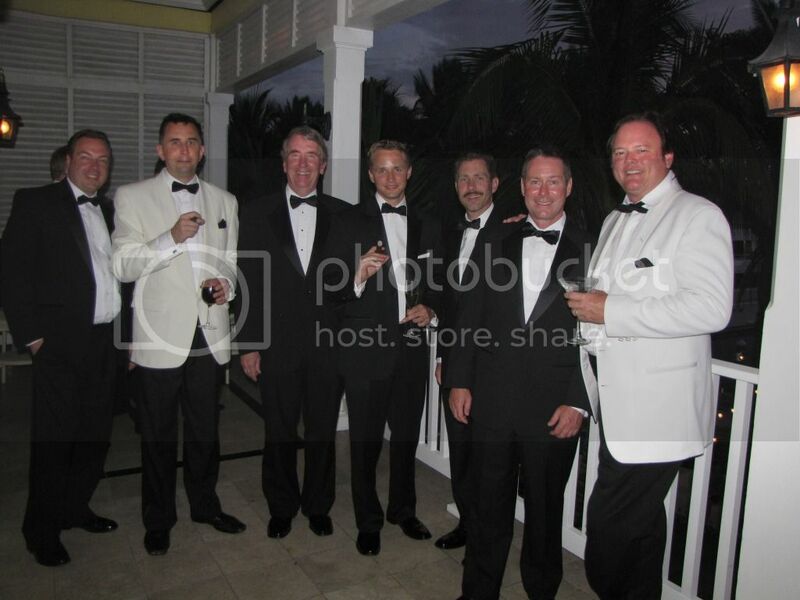 It turns out that last year's Hurricane Irene did our James Bond travel group an enormous favor when it wiped out our planned one-day visit to Nassau, because this year we had an event scheduled to cover the better part of three days. Our own orlandobond and Mrs. orlandobond laid on a phenomenal itinerary which included everything we could have hoped for and more. Other groups visited the Nambutu Embassy location from CR, likely to be the last time that's done, since the building is being demolished, and toured the downtown movie sights in Nassau. Mrs. Tallon and I recreated the Benson scene from High Time To Kill ( and were able to delight the little nun in charge of St. Joseph's (now an adult day care center) when we told her that her center was a James Bond book location). Another group tracked down the location previously occupied by the Pipe of Peace, the tobacco shop where Bond picked up Domino in Fleming's novel. It was, in sum, a phenomenal weekend. To our CBn family, everyone who attended, and especially to Rich and Leslie, our profound thanks. You're the best Bond group ever! Rather than create a new thread for this, I thought I'd just update the threat on our 2012 trip with a video that the Bahamas Ministry of Tourism has created about last month's trip. The video focuses on our tour of "Thunderball" sites, but we also took in sites from "Casino Royale" and had a day of diving to the Vulcan bomber wreck and the "Tears of Allah" fishing boat from NSNA. For what it's worth, I'm the guy in the white hat.